Hello! Hoep you had a great weekend! We had fabulous fall weather this past weekend! My husband and I took the pups on morning walks and I got the garden ready for winter! Lots of weed pulling! This suede dress was a sale find a few weeks ago! I love that you can layer it for fall! I plan to wear it with tights come winter! 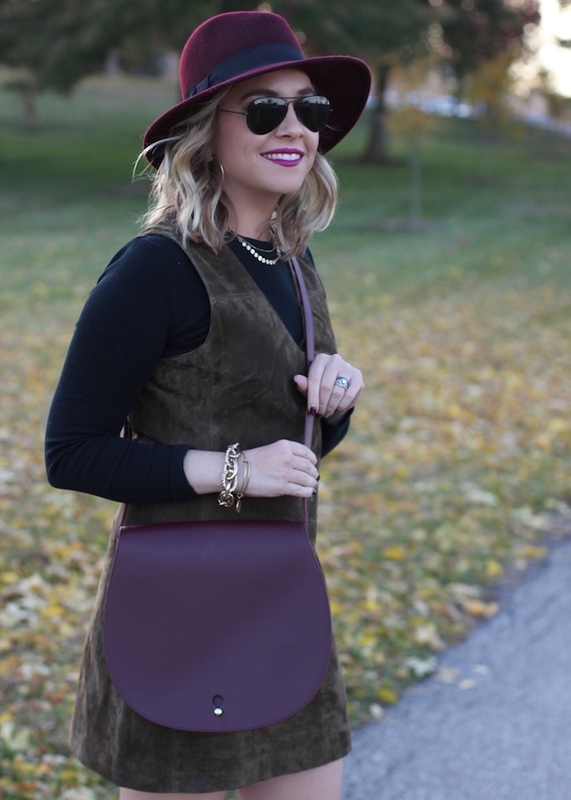 This is such a cute Fall look, love that bordeaux hat. I love how you've layered the dress! Such a cute look! So chic! Love how you paired color with neutrals! Loooove this look! And yes, just add some tights and you can easily transition this to Winter! ...although I don't even want to think about winter yet! Yes the weather has been lovely here too, so glad that it finally got cool and we have actual fall weather. This suede dress is so fun and love it with the hat, very nice!